Jason called me from work the other day and said, "I'm bringing home the coolest book!" Jason brings home a lot of neat books...he works for a book publisher and he loves to read. 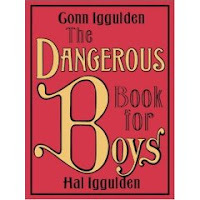 However, The Dangerous Book For Boys is exceptional! It's a gorgeous, hardback book with gold-leaf lettering that has a retro look and feel. It just feels good in your hands...almost like you pulled an old schoolbook from your Dad's bookshelf! But, what makes this book unique and special is that it celebrates the art of being a boy. According to the authors, boys are more likely to play video games after school than go outside and discover the wonders to be found there. I couldn't agree more! You'll find chapters such as, "The Greatest Paper Airplane in The World", "The 5 Knots Every Boy Should Know", and "Building a Treehouse". But, the topics aren't limited to outside activities. "The Origin of Chess", "Questions About the World", "Famous Battles", "Spies, Codes, and Ciphers", and my personal favorite, "Girls", are among the fun topics that boys can explore in this delightful book. Jason is already reading through it with Jack, and even at his young age, Jack is fascinated by the pictures and stories found inside. This would make a great Father's Day gift for a dad that has boys. It really is the coolest book we've seen in a long time! I just bought this for my husband for Father's day! I have a feeling that he will love it! Thanks for the recommendation!